I raved about Grooveshark six months or so ago when I first became a VIP, and well, I am not regretting that decision for a moment. In fact, there have been a few new welcome additions that I thought I might as well talk about in this long weekend that has seen me confined to my house for no other reason than laziness. The Grooveshark mobile app for Android is amazeballs! The new version looks fantastic, and they have greatly increased the stability. It was running fine on my HTC Magic, and it is running like an absolute dream on my Samsung Galaxy S. It is by far my most used app on the phone, and the lightning fast 2G/3G streaming as well as the much improved Offline mode constantly amaze. Grooveshark’s web interface got a nice little overhaul recently too, with the most noticeable addition being the Community section, allowing users to “follow” friends and see the music activity of their friends. It satisfies the morbid curiosity of what your friends are listening to, without them having to constantly push notifications, and it’s been yet another great way to discover new music. Grooveshark isn’t the best with statistics when it comes to what artists and albums you’ve been listening to, but with the last.fm scrobbling integration, it doesn’t need to. Apart from providing said statistics for what I’ve been listening to, the last.fm integration opens up a bunch of new services through this proxy integration. 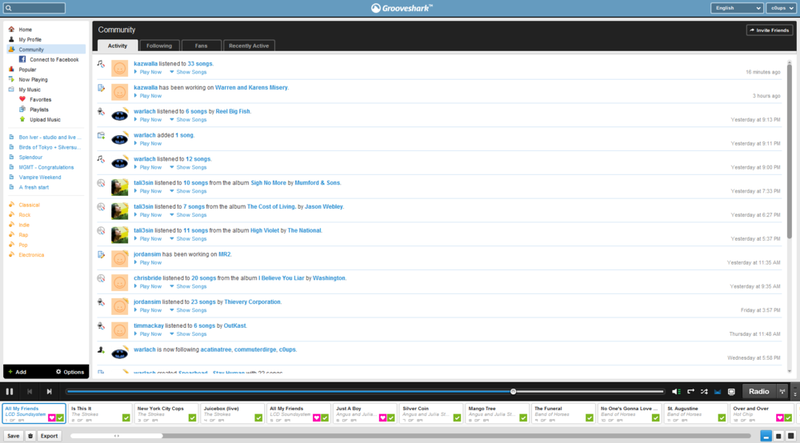 Just last week, I was checking out bandsintown.com [a service to indicate when bands you’re interested in are in town], and instead of me having to start adding in bands individually, I could throw in my last.fm account name and set up alerts for anything I’ve been listening to recently on Grooveshark! 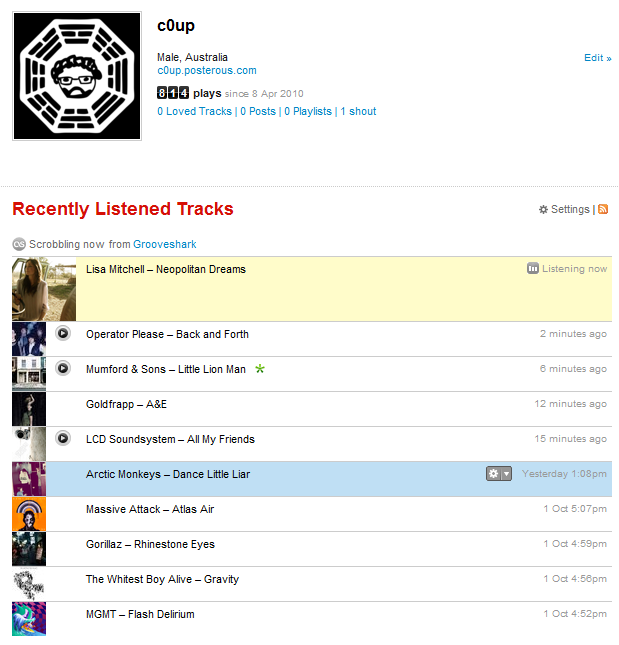 I’m sure there are a million other services out there that the last.fm integration could help with too. Search is another thing that’s sometimes flaky on Grooveshark, and I’ve often found myself typing in the name of song and getting no results when I have the darn song in my library, knowing it exists >.< The same goes for artists too. Grooveshark’s search works on a priority based system, as you’ll see by the single search box, that has to incorporate song title as well as artist and album, and while this may work on most occasions, you can get more specific with search modifiers I found recently on the Grooveshark forums. That’s all I’ve got, but if there’s anything else cool that I’ve missed, feel free to comment away below. My main issue with Grooveshark is listening to a whole album – from search, it’s hard to see what is a full and complete, and you can’t sort by track number when music is in My Music. Fair point. I think most times it is complete, but not having the track numbers doesn’t help. It probably comes down to the fact that all the music on Grooveshark is user uploaded, so if the track number ain’t in the ID3 tag, it won’t show up.